Are you looking to serve as a volunteer in some organization? Well, if that’s the case, you would have to fill up an Application Form and get yourself registered as a volunteer with the organization. In most of the cases, the organization would itself provide you with the volunteer application form where you will state your personal and other details that can highlight you as a potential volunteer for the organization. It’s generally meant for non-profits, but you will find volunteer application forms for schools, casinos, sports game teams etc. 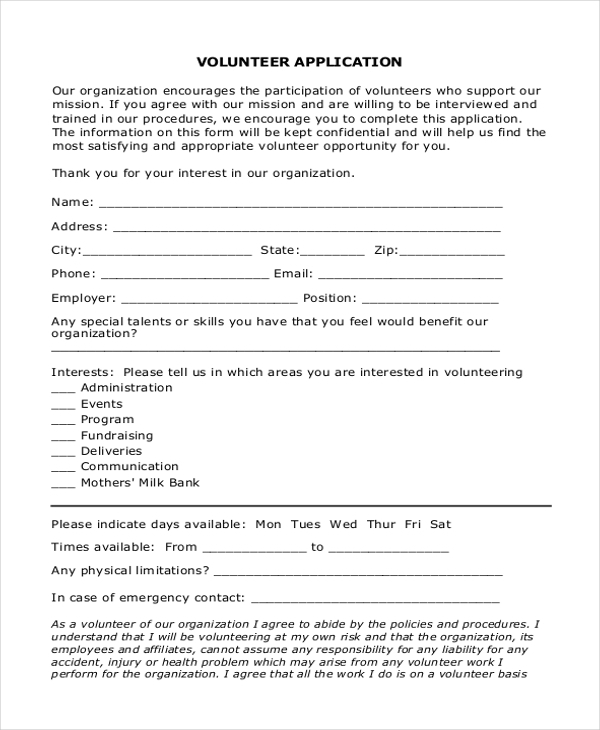 If you are planning to join a non-profit organization as a volunteer, you have to take a volunteer application form offered by the non-profit to state your willingness and qualification to serve as a volunteer. 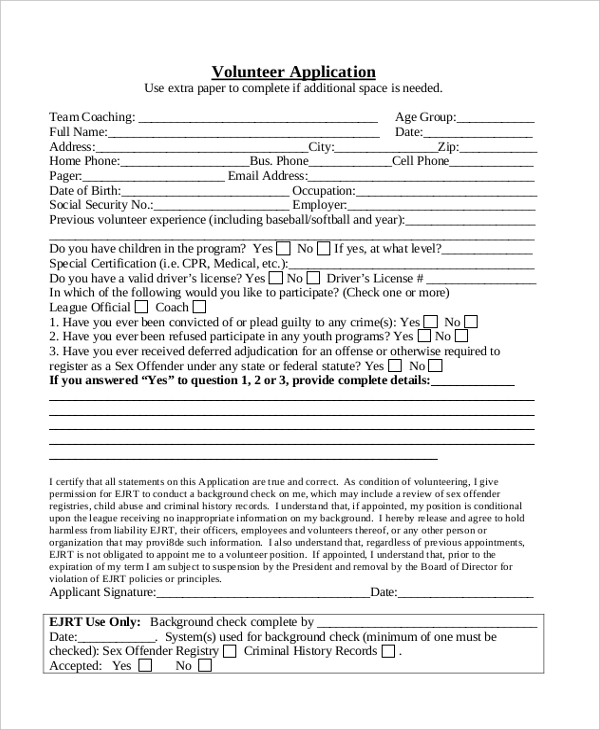 A baseball volunteer application is the form where you will state that you are looking forward to work selflessly as a volunteer for a baseball team. You can mention if you have any past experience working for a baseball team. Working as a Red Cross volunteer is a matter of great fortune for any volunteer and if you are looking for the same, fill up a Red Cross Application form. 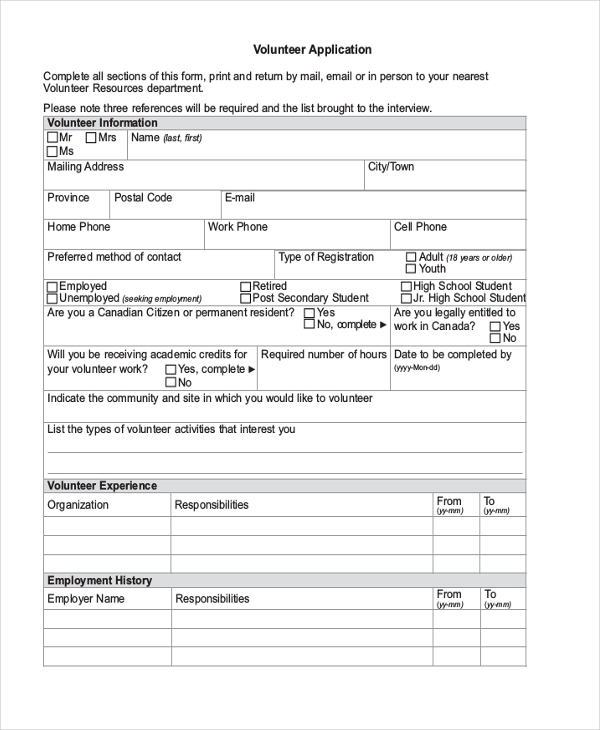 A sample volunteer application form offers you an idea on what sections to include in a volunteer application in case your organization is planning to take volunteers and you need ideas on the application form. A health services volunteer application form will enable the willing volunteers to apply as volunteers for helping health clinics with their patients and relevant services. The volunteers will get such forms from the health care centers only. If you are looking to work for a few days in the glam ambience of the casinos, helping the players with chips and serving them some refreshments just for fun, such forms would be great for you. 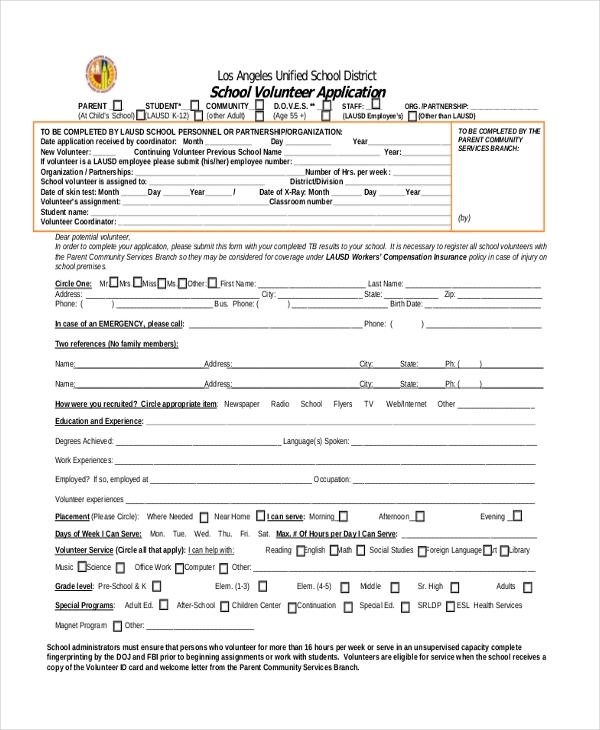 If you are planning to work as a volunteer for schools helping them with tutoring, classroom assistance, supervising the students etc., then you have to fill up a school volunteer application form. 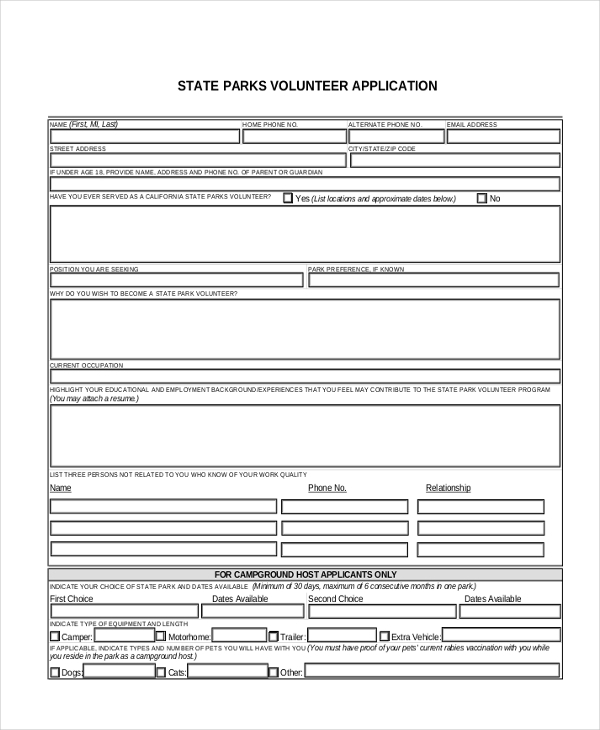 If you are looking to serve as a volunteer in a park, you would have to look for particular park volunteer application of your preferred State as there would be separate applications for every State. 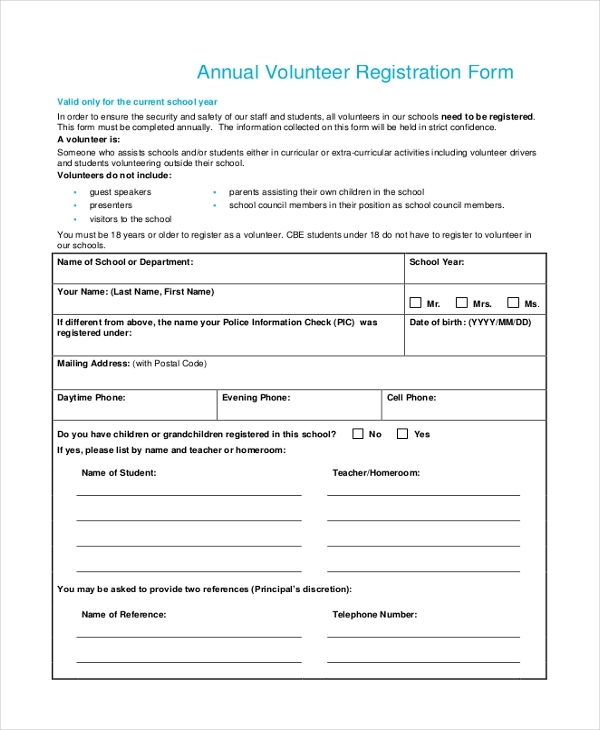 A annual volunteer registration form is the one which recognizes the willingness of an individual to serve as a volunteer and registers him or her as the certified volunteer of the form issuing organization. What Consists a Volunteer Application Form? 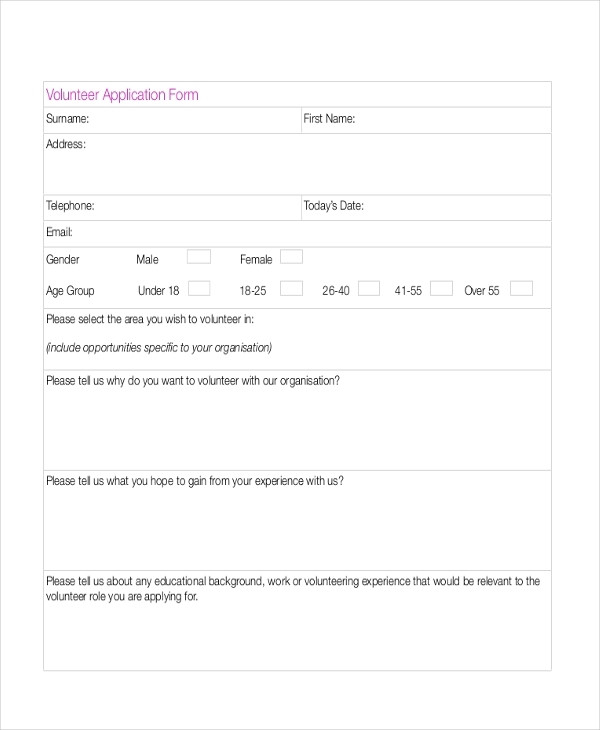 A volunteer application form generally opens up with the basic identity details of the volunteer such as name, address, contact details and so on. Then, the volunteer might need to state the specific volunteer role that he or she is planning to apply for. Next, the form would state a checklist of the different volunteer activities at an offer for the volunteers and the volunteer would have to tick on preferred options. Then, the volunteer would need to post any previous experience of related volunteer work, if he/she holds any. Some volunteer registration forms also include sections on SSN and driving license number. You may also see Grant Application Forms. What are The Types of Volunteer Application Form? Are you looking to know more about volunteer applications? Well, when it comes to types of volunteer applications, there are primarily two types of forms. The first one is volunteer application form for children. More specifically known as youth applications, such forms apply to teens aged between 15 & 17 years of age. In this case, the form would call for parent’s signature on the form as a consent. 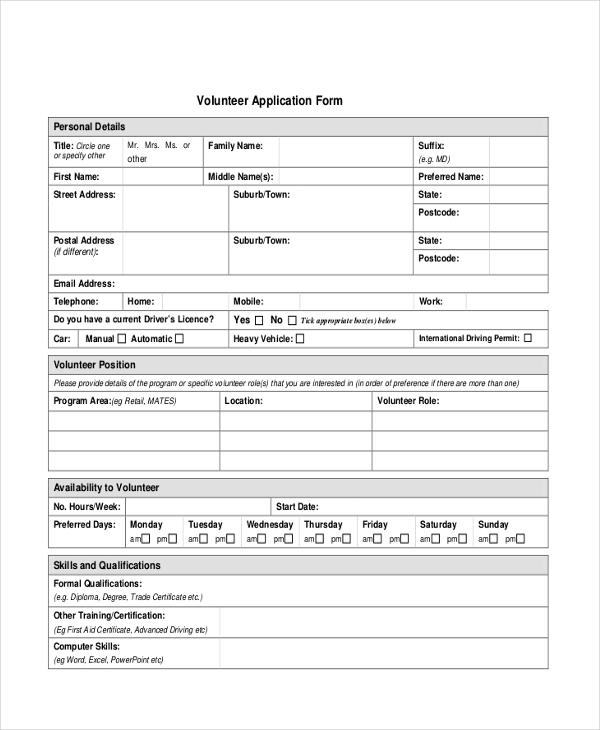 Another type of volunteer application form is an adult application form. 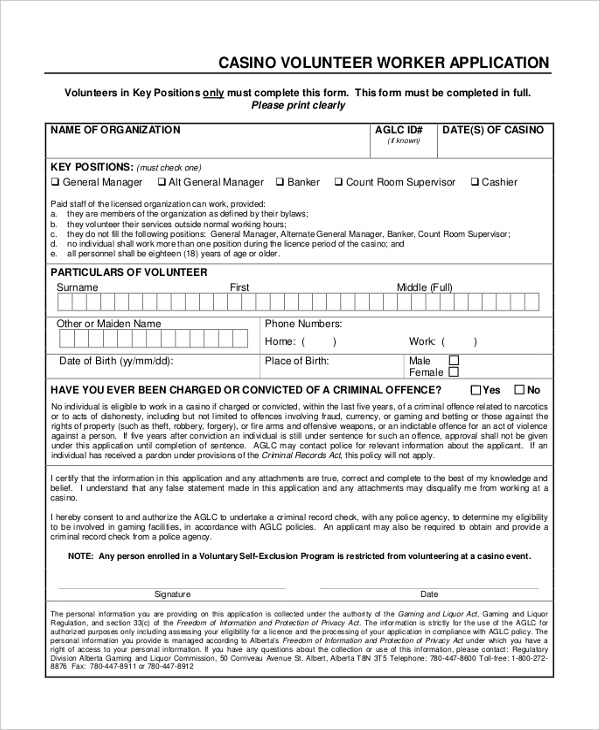 Needless to mention, these forms apply to people aged 18 and older, willing to work selflessly as a volunteer for any charity or other organizations. You can also see General Application Forms. What are The Benefits of Volunteer Application Form? If your organization is planning to take up volunteers, you must issue volunteer application form. These forms are to be filled up by interested volunteers willing to work for your team and end-users. The form will contain personal and qualification details of the volunteer. At times, it would include sections where the volunteers would state their previous experience in the related field. This will help you to screen the applications easily and choose the most potential volunteer, based on the information offered in the form. Also, such a form helps you to make everything official and organized so that you never lose track of your volunteers. you may also see Employee Application Forms. Working selflessly is a beautiful way to enrich oneself as a human being and it’s one of the best ways to reach closer to God. No wonder, a lot of good souls love to work as a volunteer and the volunteer application forms are their key to reaching that goal.